--Theresa Pierno, President and CEO for National Parks Conservation Association, had the following to say about the government reopening: "Fully reopening the federal government will mean so much to so many. Federal employees will finally get paid and be able to return to their jobs. 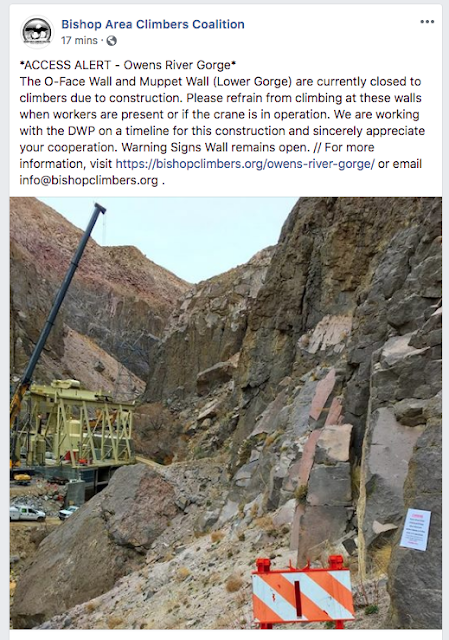 For rangers and other park staff, it will mean returning to our national parks, assessing the terrible damage done to them while they were open with such limited staff, and once again welcoming visitors to the places they all love. Now is when the real work begins. The damage done to our parks will be felt for weeks, months or even years. We want to thank and acknowledge the men and women who have devoted their careers to protecting our national parks and will be working hard to fix damage and get programs and projects back up and running. We implore lawmakers to use this time to come to a long-term funding agreement and avoid another disaster like this. Federal employees, businesses, communities and national parks deserve better.” To read more, click here. --A pilot was killed when his plane struck Mt. Hood this week. Wreckage was found on the Elliot Glacier. To read more, click here. 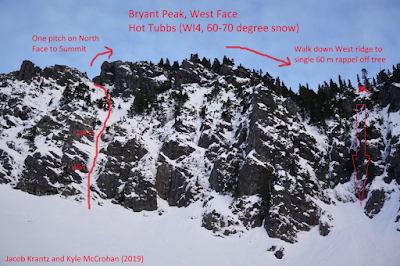 --Two potentially new alpine and water ice routes have recently gone up on Bryant Peak. Both the West Face route and Melakwa Flows were discovered (rediscovered?) by Jacob Krantz and Kyle McCrohan. To read more, to see photos and route topos, click here and here. --The Sierra Wave is reporting on some quick and excellent work by lift operators and ski patrol when a 14-year-old girl suffered a heart attack on the ski lift. To read more, click here. --Some Sierra ski resorts have had up to 13-feet of snow in the month of January. To read more, click here. --Huffpost is reporting that, "It could take Joshua Tree National Park up to 300-years to recover from damage it sustained during the partial government shutdown, a former park superintendent said Saturday." To read more, click here. --Here's a fun post about funny route names in Red Rock Canyon National Conservation Area. --A man from Ohio was revived by skiers and snowboarders who discovered him upside down in soft snow. The group in Vail, successfully used CPR. To read more, click here. --Actress and pseudoscience advocate, Gwyneth Paltrow, apparently crashed into a skier at Utah's Deer Valley and then skied away. This alleged "hit-and-run" incident left the 72-year old victim unconscious, with a traumatic brain injury and broken ribs. To read more, click here. --Alta Ski Resort now has an ultra luxury hotel. To read more, click here. --Rock and Ice is reporting that, Sam Elias and Marianne van der Steen won the Mixed Climbing Competition at 2019 Ouray Ice Fest. To read the article, click here. --ABC 8 is reporting that, " A 35-year-old California man has died in an avalanche while backcountry skiing in southwest Montana. Madison County Sheriff Phil Fortner says another skier was injured when the avalanche occurred about 1 p.m. Friday in the Tobacco Root Mountains." To read more, click here. --The women's climbing festival organization, Flash Foxy, now welcomes men at one event. To read more, click here. --In a very paparazzi-ish story, you should know that Angelina Jolie took her twins rock climbing at a gym in Los Angeles. The photos and video from the family's outing are terrible. It seems like it was more about some random photographers trying to sell photos to tabloids than showing a celebrity doing something cool with her kids. Anyway, for those who are inclined, here's a link. --Huffpost is reporting that, "An Alaska judge sentenced a man to three months in jail for his role in the slaughter of a mother bear and her two cubs in their den — actions that were caught by a research camera." To read more, click here. --A lot of your big name climbers are giving motivational speeches these days. To read more, click here. --Rock and Ice is reporting that, "on January 23, five indigenous Bolivian women, aged 42 to 50, completed a climb of Argentina’s Aconcagua (22,841 feet), the tallest peak on both the continent and in the world outside of Asia. The women, who worked as porters and cooks in mountain camps on Huayna Potosí (19,974 feet), one of Bolivia’s tallest peaks, for a number of years, are members of the Aymara indigenous group." To read more, click here. To see a video about these women, click below. --A new documentary is telling the story of immigrants in ski towns. To read more, click here.